With over 40 years of experience, we have accumulated vast knowledge in specifying electrical power cylinders for many applications. Energy efficient, easy to use and incorporating all necessary safety features when overloaded, Tsubaki power cylinders combine reliability with simplicity. 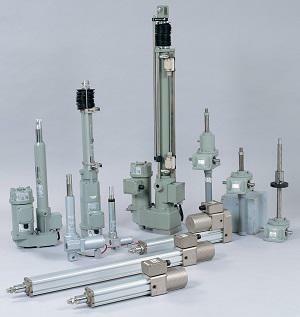 Our power cylinders do not require hydraulic or air lines, keeping operation simple. Built-in safety devices are available for all series - while adaptability means our power cylinder range can be used with various motor specifications. Our ultimate aim is to produce high performance products that are customer friendly in any application. Download the Tsubaki Power Cylinder catalogue here.